The Crystal Ship, curated by Bjørn Van Poucke, brings art to the quayside in Ostend for the third time and will bring more than fifteen international and national artists to Ostend this year in order to let loose their creativity on the city. The artists will begin painting during the first week of Easter holidays and their work will be formally presented to the public on 7th April 2018. Over fifteen (inter)national street artists will create outsized murals and art installations using the City by the Sea as their canvas. Artists invited so far include; A Squid Called Sebastian (BE), Colectivo Licuado (URY), Jaune (BE), Joachim (BE), Matthew Dawn (BE), Milu Correch (AR), Oak Oak (FR), Telmo & Miel (NL) and Zoer x Velvet (FR) will be coming to put their mark on Ostend. “The aim of The Crystal Ship is to bring art closer to people, to residents. 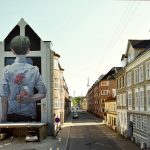 Our approach is to have artists do their thing in the centre of town, right on neighbourhood walls, in all the places where people live, work, etc. The first two editions of The Crystal Ship have proved that art in Ostend is right there next to you, accessible, and that this was and is enormously appreciated,” Mayor Johan Vande Lanotte.